The hard clam (Mercenaria mercenaria) is one of several different species or types of clam found in New York's marine waters. Though you may not recognize the term "hard clam," you probably know its market names: chowders are the largest, cherries or cherrystones are medium in size and littlenecks are the smallest hard clams. Littleneck, also referred to as necks, are the most comercially valuable of the three, traditionally consumed cooked or raw on the half shell. 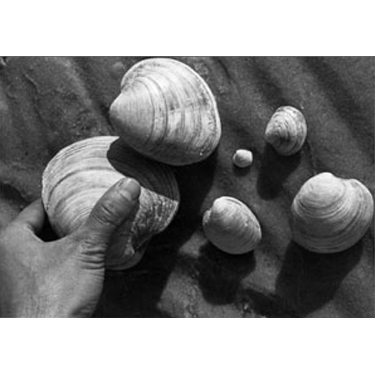 Other clams harvested in New York waters are surf clams, ocean quahogs and softshell clams or steamers. The hard clam (or northern quahog) lives in shallow coastal bay waters in areas with a soft sandy bottom. The clam burrows into the bottom substrate leaving only the siphon exposed to pump water containing food and oxygen and to dispose of waste. Scientists estimate that hard clams reproduce in 1 to 2 years, and that the average number of years required to reach a commercial size is about 3 years in the New York, Rhode Island, Massachusetts area. Actual growth rates are dependent on a number of factors like water temperature, salinity, and dissolved oxygen, the quality and quantity of available food, and other factors. Hard clams comprise one of New York's most important commercial fisheries. For example, the value of New York's hard clam harvest was approximately $18.5 million in 1997. It is for both economic and ecologial reasons, though, that hard clams and their fishery are of importance, interest, and high visibility to Long Island and its residents. Many agencies, groups, and individuals have long had a stake in this natural, economic, and even cultural resource. Commercial hard clam harvesters are referred to as "baymen," "clammers," or "clam diggers" on Long Island where most of the state's hard clams are harvested. New York baymen work primarily in Long Island's unique and extensive system of inshore bays and waterways which are considered to be among the most productive areas for clams in the nation. Clams are harvested in Long Island's South Shore bays from Nassau county to the Great South Bay and out to Southampton Town; in the Peconic and Gardiners Bay system on the East End; and along the North Shore in Long Island Sound from the eastern tip Long Island to the western towns in Nassau county. Clams are also transplanted from Raritan Bay to certified Long Island waters where they are re-harvested after a specified period of time. At one time, New York provided more than 60% of the nation's hard clams and Great South Bay was referred to as the world's richest clam factory. For every year from 1970 through 1994, the dockside value of hard clams landed in New York has exceeded that of any other fish or shellfish species landed in the state. Landings of these shellfish hit an all-time record in 1976, totaling more than 700,000 bushels. But harvests started dropping, and people began to look toward understanding the environmental conditions of the Great South Bay and the possibilities of aquaculture.